Text: I was conscious of a distinct break between the crisp, official atmosphere of Berlin — where the war hurts least and the mechanical appearance of success is strong — and the sentiment of the rank and file of people whose suffering, as the war continued, became a more and more important factor. On the night of my second arrival in the capital I sat in the rear of a motion-picture theater, just off the Friedrichstrasse. 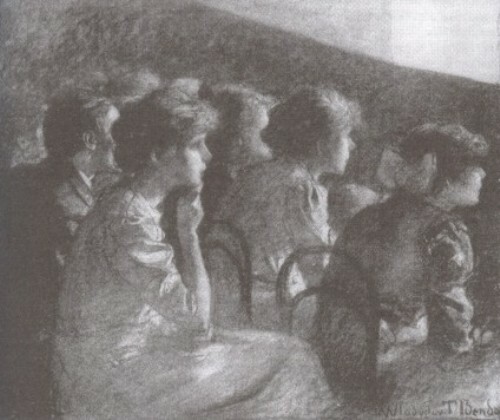 It was a long, dark hallway, such as one may see in any of the cheaper “movies” on Washington Street or Broadway, where the audience sits in silence broken by the whirr of the cinematograph and in darkness pierced by the flickering light upon the screen. The woman in the seat beside mine was the typical Hausfrau of the middle class. She was, of course, dressed in mourning: the heavy veil, which was thrown back, revealed the expression so common to the German widow of to-day — that set, defiant look which begs no pity, and seems to say: “We’ve lost them once; we’d endure the same torture again if we had to.” It was a sad enough story that the reel clicked off, and about as melodramatic as “movies” usually are. But the woman kept herself well in hand, since the public display of grief is forbidden and they who sorrow must sorrow alone. A Bavarian boy, as I recall it, — the youngest son, — runs away from home to join his father’s regiment in Poland. When his captain calls for volunteers for a dangerous mission, the boy steps forward. For hours they trudge over the snow until surrounded by a Cossack patrol. The Bavarian boy, although having a chance to escape, goes back under fire to succor his wounded comrade. Just as he is about to drag the comrade into the zone of safety, a bullet pierces his lung. For two days he suffers torture on the snow. The body is found and brought home to his mother. Now and then the widow next me bit her lip and clenched her fist, but she gave no other sign of emotion. Another film was thrown on the screen, humorous, I believe. Suddenly the woman began to laugh. She did not stop laughing. It was a long, mirthless, dry, uncanny sort of cackle. People stared. She laughed still louder. An usher came down the aisle, and stood there, uncertain what to do. Hysterics had given way to weeping: the tears were now streaming down the woman’s face. She tried to control herself, but could not, and then arose and between choking sobs and laughter fled from the darkened room out into the Friedrichstrasse. Comments: Horace Green (1885-?) was an American journalist with the New York Evening Post, who visited Belgium and Germany during first few months of the First World War. This entry was posted in 1910s, Germany, Travel writing and tagged Berlin, Cinemas, Horace Green, Staff, War films, Women. Bookmark the permalink.